We’ve got a lot of cool stuff and cards to cover this week, so let’s get right into it. First off, the last article was #20. This is a small milestone in regards to the whole Magic community, but a pretty large one for me. Thus, I wanted to start this article with a big thank you to the Quiet Speculation team, readers, and Magic: The Gathering community. This is an incredible game that has shaped my life and the lives of many others. And with the recent release of Magic Arena, I can see Magic continually moving forward in the right direction to expand its reach to many more people across the world. As part of this thank you, I’m going to try something new this time. I’m going to start off this article with the Recent Sells section. But that’s not the twist. Rather, I want to get your feedback on what I should use my Card Kingdom store credit on. 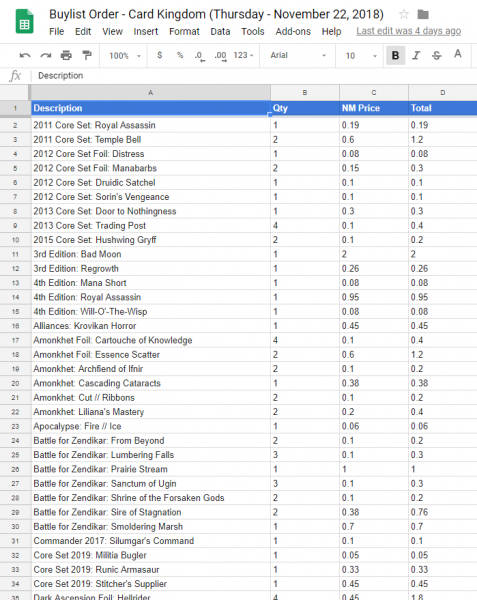 Take a look at the list of cards that I buylisted and the amount quoted (before grading). Then use the following links to make suggestions on what cards from Card Kingdom I should get and why. As a result, I will send each person from the United States who responds with a legit answer, four foil Accumulated Knowledges from Masters 25. And don’t worry, we’ll also get to some nice lists of cards to pick up and get rid of owing to the full list of Ultimate Masters cards that was recently revealed. Take a look at the buylist order here. Link this article and let me know what I should buy on Card Kingdom and why on Twitter or Facebook, and I’ll get back to you. 1. Tag me on social media @edwardeng. 2. Link the article when you tag me. 3. List what cards you think I should buy. 4. Tell me why I should buy those cards. 5. If legit, I’ll send you a free playset of foil Accumulated Knowledge from Masters 25. Many people have been focused on a lot of other popular cards that weren’t reprinted in Ultimate Masters like Surgical Extraction, Thing in the Ice, Foil, Goblin Lore, Manamorphose, and Collected Company. However, there hasn’t been that much talk about the Tron lands. Maybe that’s because they’ve been printed many times. Maybe it’s because a lot of people don’t like Tron. Who knows. 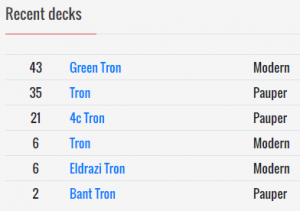 Regardless, Tron is a pretty popular deck. And it’s a deck that does quite well in many different forms in Modern. The lands also see a lot of play in Pauper. Not to mention that Antiquities goes way back and is legal in the Old School format. If you need or want these, now is a pretty good time to get them. And once you get them, you can pretty much hold on to them, as they’ll just continue to go up in value because they’re so old, iconic, and useful. This has been on the rise for a little bit now and could continue its upward climb since it’s another card that didn’t get reprinted in Ultimate Masters. If you don’t have them and need or want them, it’s still probably a good time to pick them up; but I wouldn’t get too many extra playsets. 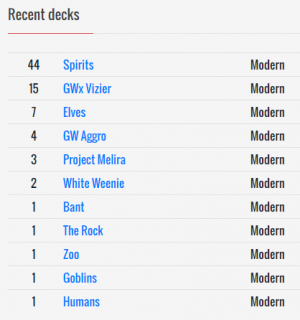 It sees a decent amount of play in Modern via Affinity, Modular Affinity, and Colorless Eldrazi. So the demand is there. And don’t forget about foil Serum Powder in Colorless Eldrazi, which I mentioned in article #18. Take a look at Mashmalovsky’s list for reference. Guilds of Ravnica is starting to finally cool down a bit now since many people are focused on Ultimate Masters. 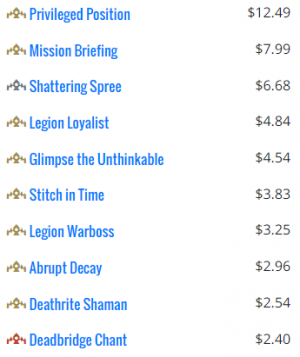 So this is a decent time to start looking at some multi-format players such as Legion Warboss. 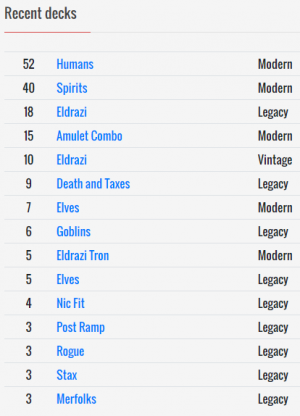 Outside of Standard, it’s been showing up in Legacy’s Dragon Stompy and Modern’s Goblins. Take a look at Jundilion and Kylehl’s respective lists for reference. The reprint of Ancient Tomb in Ultimate Masters is a nice little bump in supply for this deck as well as many other decks in Legacy. On top of Ancient Tomb, Ultimate Masters adds more copies of Cavern of Souls to the market, which is nice since it also sees a ton of play in multiple formats. These are a bit tougher to deal with compared to their Antiquities counterparts mentioned in the Holds section above. The price ranges between Mid and Market on TCGplayer is a bit wide. So if you have these and want to lock in value now, you’ll have to dig a little bit deeper into the different foil versions to see what’s going on and how much you want to get rid of them at. But I can also understand if you want to hold onto these since they didn’t get reprinted in Ultimate Masters. However, I would just be careful, as these will probably see a reprint at some point in the future. And those reprints could very well contain new foil versions which could tank the prices of these. They’re pretty high right now but should continue to grow a bit until the reprint happens. This and the next two cards also dodged an Ultimate Masters reprint. While this is a newer card than the other two, it’s been over two years since it was printed. 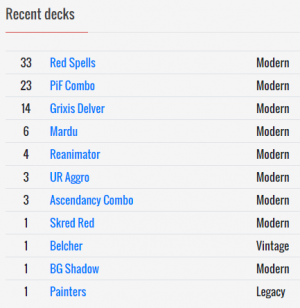 And it’s starting to see a sizeable amount of more play in Modern thanks to Arclight Phoenix. Take a look at Ross Merriam’s top list from SCG Las Vegas. I think it’s time to cash in on the hype and shortage that’s happening. This was a sorely needed reprint since supply is pretty low. We saw a gigantic spike to $30 for this uncommon with the emergence of Hollow One decks like Hollowine in Modern. And now the card is even seeing play in the new Red Spells deck…again, thanks to Arclight Phoenix. Take a look at Fortini’s list for reference. With that said, you might want to wait just a little bit to see if there’s another spike coming, which could happen in next month or so. Here’s the other card that really needed a reprint. 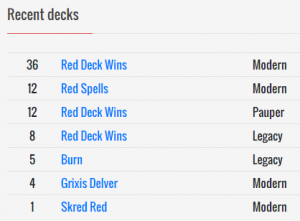 Look at all the decks that play the card in multiples. I’m also not sure when this will get reprinted, but it definitely will at some point. And if you’re holding extra copies, I’d sell into the demand that’s causing the huge spike right now. As mentioned above, Surgical Extraction, Thing in the Ice, and Manamorphose have all seen spikes already because they weren’t reprinted in Ultimate Masters. And Goblin Lore has already spiked once and hasn’t dipped too much since then. But Collected Company is a little bit different. It seems a little bit off the radar of some people. It definitely sees a lot of play in Modern and could see a spike very soon. So if you need or want these, you might want to consider picking them up now, especially because Spirits is currently one of the top decks. This spiked pretty hard earlier this year and has been falling sharply ever since. And now might be a good time to pick this up, especially with this reprint. And just a quick note, there are a few other cards to note that are currently in the top ten prices of this supplemental product. They are Mission Briefing which I mentioned in article #19, Legion Warboss which was mentioned above, and Legion Loyalist. And take a look at the newest take on 8-Whack that Kelmasterp has been doing well with lately on Magic Online. I like the inclusion of Signal Pest, as it improves the percentage of cards you can cast with the green mana from Burning-Tree Emissary, which I’ve thought to be a problem of the deck for quite some time until now. Next, I’m going to do something a little different since it seems like a lot of people have been focusing on the cards that were missing from Ultimate Masters. Instead, I want to highlight cards to keep an eye on as the supply enters the market. I mentioned this as a Fold in article #11 a little over two months ago. Let me know in the comments below if you took advantage of that. Now that it’s been reprinted, play close attention to the non-foils. I think I’ll pick up a playset if they fall below $10. I’ve wanted to add a playset to my collection for a while since the hybrid mana makes it pretty versatile and still pretty popular even with the printing of Assassin’s Trophy, which I thought might overshadow Fulminator Mage. This was actually reprinted a little over a year ago in the Duel Decks: Mind vs. Might product, so there’s already been a slight increase in supply. But there will be a lot more copies on the market very soon, which is nice since it’s starting to see even more play on top of Storm; again, thanks to Arclight Phoenix via the Mono-Red Spells deck. If the foils drop to about $3, I’ll pick up a playset. Speaking of the Mono-Red Spells deck, here’s another card that sometimes show up in that list. Take a look at kbzx’s list for reference. This equates to even more demand for the card on top of Burn in Legacy, Modern, and Pauper. So you might want to be considering getting these if they hit $3. This is going to be interesting now that it’s a common, making it legal in Pauper. This might push Delver decks way over the top, resulting in a ban (not sure which card). So I’d be careful with this one. But if you can get them for $3 or less, the risk isn’t too bad. And the artwork is nice! Foils are crazy expensive, starting out at $24.99 on Card Kingdom. 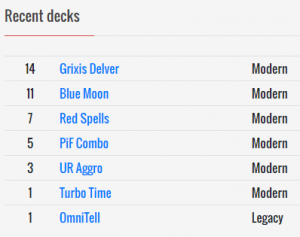 Funny thing is, that kind of makes sense since it sees a lot of play in all these decks and as a four-of. I’ve been wanting this card for a while now. And if they drop to about a buck or two, I’ll definitely pick up a playset. If this falls to $5, I’ll probably pick up a playset. The Bridgevine deck almost seemed like a flash in the pan, but maybe it was because there was a low supply of this card, and it shot up in price very fast. However, it is still a powerful deck and still shows up. 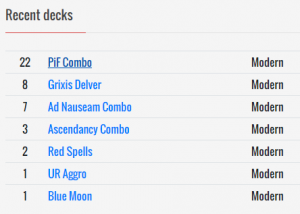 As a matter of fact, a 5-0 list just showed up on Magic Online courtesty of audio336. This list even includes quite a few new cards with a full playset of Assassin’s Trophy in the sideboard along with a copy of Necrotic Wound. It’s also nice that Vengevine got a reprint in Ultimate Masters, making this deck’s key pieces even more accessible. 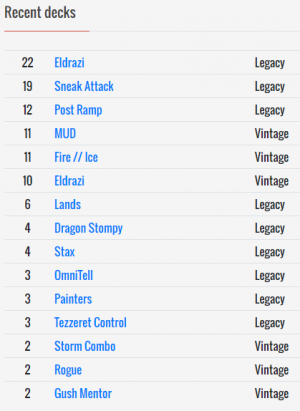 While we’re on the subject of graveyard decks, as mentioned in article #20, Dredge is still very powerful and prominent in Modern. It’ll be nice if this hits $1 since the Ravnica version shot up to about $6. This usually only sees play as a one-or two-of in Modern and Legacy, so either way, I think you’re fine picking up what you need. If you want shiny things, go for the foils if and when they hit about $5. If you’re a plain jane, go for the non-foils if they hit $1. I’m not really sure how much Ultimate Masters will be opened. But if there’s enough supply that hits the market, it’s possible the non-foils hit $2-3. I would pick up a playset if it does. I doubt the foils will drop to $10. But if they do, I might consider picking up those instead. This is listed as a Watchlist item because it sees a good amount of play but not usually as a four-of. 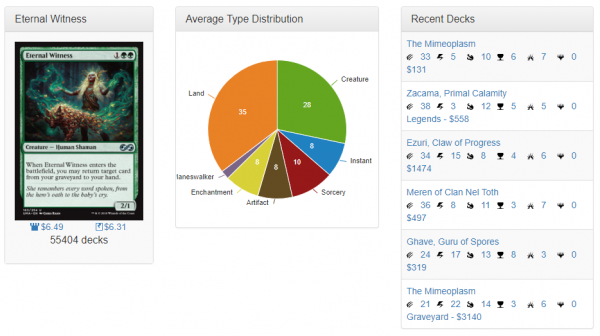 Green is also very powerful and popular in EDH/Commander with Eternal Witness showing up in a whopping 55,000+ decks. A hundred dollars is a little steep for the Box Topper version, but maybe it’s worth it. It’s hard to say. If you have the cash, go for it. Otherwise, you’re probably better off sticking with non-foils or maybe regular foils. Office Hours #3 is coming up, and I’ll be co-hosting it with Sigmund Ausfresser. If you have a Quiet Speculation membership subscription, you can catch the audio of Office Hours #1 with Sigmund Ausfresser and me here in case you missed it. Or you can listen to Office Hours #2 with Christopher Martin and me here for free. Office Hours #3 is set for Thursday, December at 8:00 p.m. Central, so mark your calendars and join us in the Discord channel if you have a Quiet Speculation membership subscription. Link this article and let me know what I should use my store credit on that I got from my recent buylist order to Card Kingdom and why on Twitter or Facebook, and I’ll get back to you. 3. List what cards should I buy. Concerning eventual bans in Pauper down the line, my thoughts lean toward Gush. While it isn’t as broken of a spell as it was in Vintage (where it took them several times to learn from the mistake of unrestricting it), Pauper is currently the only Format where you can play a full set of the card. With Foil becoming legal, it effectively turns Gush into “Sacrifice 2 Islands, Draw 2 Cards, Counter target spell” at the very minimum. 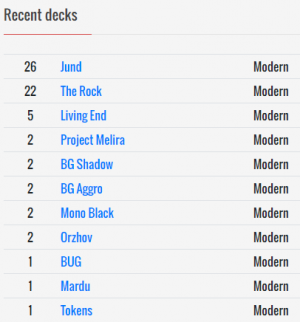 With Pauper becoming a Competitive format on MODO, I don’t think this interaction will last very long. Daze even becomes “Counter target spell unless an opponent pays one, if they do, Discard a card and that Island you just picked up to counter that spell.” Foil won’t be a 4-of, but it will start showing up in numbers in Pauper (along with Fire/Ice, but that’s a different topic). I think your assessments are quite accurate, Zeb. While I don’t like to talk too much about bannings in general because it’s all speculative (contrary to part of this site/brand’s name), the Magic Online results have quite a bit of data showing Gush decks winning a good amount of the time. Thus, I think this could be a good indicator that Wizards could potentially have Gush and other cards on a watchlist. Time will tell.